It’s been called “cross country on steroids”. And while fell running isn’t well-known outside of the UK, many believe that it has produced some of the best and toughest athletes Britain has ever seen. “P2240238-1” by simonsimages. Licensed under CC BY 2.0. So what exactly is fell running? A traditional form of mountain running that is practiced in Northern Britain, fell running is regarded by many as the predecessor of modern-day mountain running. The term “fells” refers to the sloping, round mountains or high moorland of Northern England, Scotland and Wales – terrain that has been frequented by local shepherds for centuries. In fact, it is believed that the first fell runners were indeed shepherds. In contrast to neatly-marked trail races, fell running leaves finding the best course up and down a mountain entirely up to participants. Runners literally claw and scramble their way to fell summits and back down – along any route they think is quickest. A method that obviously favors locals who spend many an hour navigating the fells for fun. The best fell runner is therefore also not always the fastest one, since finding the best line to a summit and tackling your chosen line with tenacity is equally important. And, of course, good map- and compass reading skills are a bonus! But don’t be fooled. Fell running is not for the faint-hearted. Even seasoned runners struggle to put its sheer brutality into words. “The technique and fitness required to ascend and descend hills is phenomenal. In my humble opinion, fell running sorts the men from the boys”, says adventure runner and film maker, Tobias Mews. “High Cup Fell Race 2018” by simonsimages. Licensed under CC BY 2.0. So how did it all start? It is said that, in the mid-1800s, wealthy Londoners started heading the fells of the Lake District for leisure-time getaways. However, not being familiar with the area, they needed someone with an intimate knowledge of the mountains to act as guides on these outings. And who better for the job than the local shepherds? From there the fell guiding business grew very competitive very quickly – so much so that guides’ races were organized to identify and crown the best of the best. These races usually coincided with annual sports- and games events in the rural Lakeland towns, many of which still take place today. And the rest, as they say, is history. The fell racing scene soon boomed into a minority lifestyle sport favoring those with wills (and quads!) of steel. Today fell running is governed by the Fell Running Association, with literally hundreds of events to choose from on the annual fell racing calendar. Races vary in both distance and difficulty, with race distances classified as long (12+ miles), medium (6 to 12 miles) or short (up to 6 miles), and race difficulty graded as either A, B or C.
But what exactly is the fascination with running up and down mountains? And why do the diehards choose to do this for fun, year after year, even in the absence of shiny medals and big prize pots? Perhaps it’s exactly that. Many fell runners love the simplicity of their sport. Even though it’s been around for centuries, it has somehow managed to escape commercialism. In fact, many fell races cost as little as £4 to enter, with zero bells and whistles. And that’s exactly how the fell running tribe prefers it. For others, the appeal of the sport lies in facing off against Mother Nature. Just them, the elements and the will to conquer. Back-of-the-pack fell runners also swear by one other element that forms part of the fell running experience: Camaraderie. Participants are known for their unspoken solidarity, often joking, cajoling and motivating each other right to the end. And although their fame is mostly limited to fell running circles, the sport has produced some of the best athletes the UK has ever seen. Take, for example, Kenny Stuart, a gardener from Keswick. In 1984, Stuart completed the Skiddaw fell race, which covers 9.6 miles but boasts 2 500 feet of climbing, in a remarkable 01:02. Or take Joss Naylor, a shepherd from Wesdale valley. In 1975, Naylor linked the summits of 72 different fells in 24 hours, a feat that is believed to have covered in excess of 100 miles, with 37 000 feet of climbing. His record stood until 1988. And if you think that fell running is a “guys only” affair, think again. In 2016, farmer Nicky Spinks became one of only a handful of souls who have successfully completed what is known as a “double Bob Graham”. This challenge consists of traversing 42 fells in under 24 hours, twice, or, if you want to be more specific, covering 132 miles with roughly 54 000 feet of climbing. Spinks’ time of 43 hours and 30 minutes is a record to this day. So do you have what it takes to be a fell runner? Apart from good navigational skills, you’ll also need an extra helping of mental strength, sharp reflexes and a good sense of humor. Not to mention a generous travel budget if you live outside of the UK. Does that sound like you? Then head on over to the Lakeland and give it a go. But be warned: Brutal as it may be, rumor has it that it’s highly addictive! 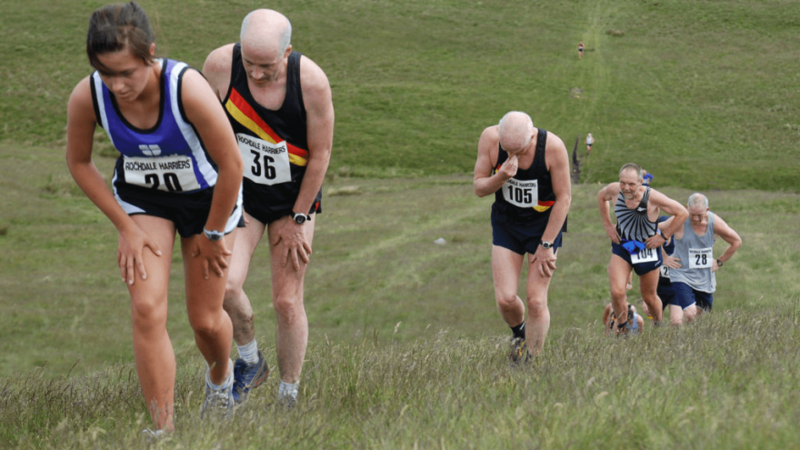 Featured image source: “Knowle Hill fell race” by Dave Haygarth. Licensed under CC BY 2.0.